Update January 16th, 2013: As NØ aluded to in his previous post, I have finally returned from my adventures in darkest Africa. He and I will be working to re-upload many of the albums that were lost in the great file purges that took place on many of the major file hosting services after the seizure and closing of Megaupload. Almost every blog was affected by this, and unfortunately ours was no exception. Before these purges, Mediafire was easily my favorite file hosting service of choice. However, after reading about how they deleted countless files that were perfectly legal, such as music released under a creative commons license, or shared with permission from the artist, I have decided to look for greener pastures. This means I am going to have to experiment with different hosts until I can regularly deliver download links from a reliable host. Please comment if any of you can recommend a good file host. I have been away for nearly a year, during which I had access to the computer/internet very little, and a lot can change during that time period on the internet. The primary thing I am looking for is a hosting service that provides longevity, in that they are unlikely to delete the file due to a DMCA complaint or a mistake, as far as the files are concerned. Of course, it would be great if this host met other standards, such as: acceptable file size limitations, no wait time for free users, fast download speeds etc. Again, please leave a comment if you can recommend such a host. I will be conducting an experiment of my own to find the best possible host in the meantime. This will be the first of what will be many posts containing updated download links. 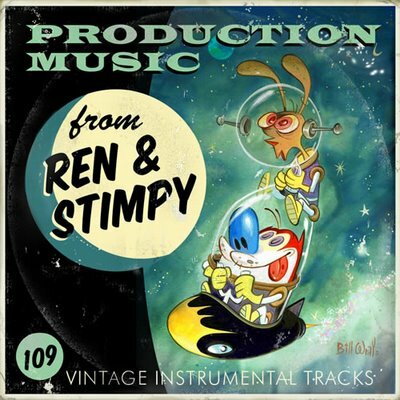 I will begin re-upping Ren & Stimpy Production Music Vol. 2 as soon as I finish writing this. After that I plan on focusing on the posts which have the most re-upload requests. For those who may be new to this blog, I hope you enjoy what we have in store for you, and to those long-time visitors who might still be around, I hope that you discover something that you may have missed the first time around. "From the moment I experienced my very first brilliantly stupendous episode of the Ren & Stimpy show my brain has ruminated on how to get my hands on that wonderful vintage "incidental music" that sets the tone for their zany, wacky, madcap antics. Eventually the internet taught me that the music of Ren & Stimpy comes from all over the place. Some was written for the show, some are well known classical pieces, and there are quite a few works by Raymond Scott. For me, the most elusive stuff has always been the authentic "production music" from the 1950s. A couple months ago I discovered that some dear soul (or souls) had assembled a massive collection of these aural delights, and made them available on a torrent site. It was as though the Gilded Yak had answered all of my letters at once! And you guessed it, I'm making this marvelous collection of classics available to you, the valued internet user. Put simply, these melodies have enriched my life. Play them on your drive to work and you're the star of an instructional traffic safety film, turn it on during dinner and mealtime becomes 80% happier (but be careful.. play the wrong track and you could wind up with a touch of Space Madness). Best of all you can listen and imagine that you live in the world of Ren and Stimpy where the walrus-napping horse is your next door neighbor, where the toy stores are stocked with Log from Blammo, and a visit from Powdered Toast Man is just a complaint away! Since this stuff is already available 'out there' I decided to add some extra value before I handed it off to you folks, and therefore I did the following..
-Created a track listing based on musical styles. It kicks off with some general '50s domestic lollygagging tunes and then it gets more downtown hustle and bustle-ish. After that it goes spooky, glamorous, romantic, and finally dramatic. It is my pleasure to present you with the unofficial Ren & Stimpy Production Music collection. Be happy happy and enjoy joy joy it! - Kirk Demarais"
Thanks for this!!! Looking forward to Vol 2!!! still only 99 tracks after dl'ing twice. Anonymous: Can you please tell me if you have tracks 1-99 or do you have tracks 1-109 with a few missing somewhere in the middle. I'm hoping it's the former rather than the latter so I can simply just upload tracks 100-109 for you. Please let me know when you can. I'm sorry for the trouble. Just read the comments. It's the former, as you wanted to know. 1-99 correct. Last 10 missing. I apologize for the confusion everyone. There were indeed only 99 tracks. There was a big mixup on my part, but I will be reuploading this with all 109 tracks as soon as I complete the post I'm currently working on. I also plan to post Volume 3 once I have reuploaded and posted Volume 2. I'm one of the anonymous from earlier, "Thanks a bunch, and you're a god. :)"
Thank you for reposting these, and quickly to boot! You're awesome. :) Look forward to following the blog now and finding other treasures! Thanks for all your work properly listing the artists. I'm eagerly awaiting vol 3 !!!!! @Michael: Thank you for the kind words. I hope that you enjoy this collection, as well as some of the other material I have posted in the past. I hope to see you here again. Take care. @WackyStuff: You're welcome. Unfortunately I have encountered a major issue which is preventing me from posting Volume 3 at the moment. I obtained Vol. 3 from a torrent site. Unfortunately none of the album artists are listed, nor have I been able to find a track listing floating around. Hopefully someone will be able to help me find one, but until then I'm going to have to put Vol. 3 on the backburner. would you like to exchange link with my blog??? @Reese Kaine: I am waiting until I finish the :Nightmare Before Christmas" project to work on re-uploads, but I will make an exception in this case, since I realize this post is one of the most popular on the entire blog. I will have this re-uploaded within the next couple of days. How do you play these I have tried everything? Hey, thanks a lot for these! If you're willing to post Vol. 3 to mediafire and email me the link I'd be glad to help track down artists and a tracklisting. [winthropite] at [gmail] dot [com]. thank you so much for this contribution, I will never forget this kindness! This is GREAT stuff!! Have been looking everywhere and only have bits & pieces. Thank you, Thank you, Thank you for all your hard work. Any chance you have the 'Muddy Mudskipper Show' theme anywhere? Very very nice, thanks. You post good music materials. Nice work! Thanks tons!! Happy Happy Joy Joy! Is there a Vol 3 coming?? very nice this post! Waiting for vol3 ! +1 blog follower! Thank you, so much! You've made me very happy, happy! Joy, joy! El primer enlace (Zippyshare) trabaja, así como los enlaces de Zippyshare Vol 2, partes de 1 - 3. Erm... are these downloads safe? The first link is Zippyshare. They are as safe as any. The first mirror is nolonger available. The second mirror seems questionable. I'd stick with the Zippyshare. That raises a second question: are the copyrights on these things expired? You can read elsewhere on the interweb about Production Music & its use. Basically it is free to listen to as it was licensed for a certain production & the fees were paid then. If you were going to use the music in a project of your own, you would have to pay a small fee. If you are just listening for your own enjoyment, then you may. If you read more about Production Music & still do not feel comfortable downloading it, then just don't. This is awesome, thanks for putting it together. Really nice job on the artwork too.